Diabetes is very easy to predict (see Indian Diabetes Risk Score) as well as diagnose with a simple blood test even from a finger stick. However, one-third to one-half of people with diabetes are undiagnosed worldwide. The average person with diabetes does not typically get diagnosed for four to seven years. Yet, undiagnosed individuals with diabetes are at high risk for heart disease, stroke, kidney damage, blindness, and other complications. These problems may progress more rapidly in individuals not receiving appropriate medications or pursuing lifestyle changes. 3. Ramachandran A, Sathyamurthy I, Snehalatha C, et al. 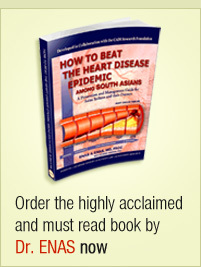 Risk variables for coronary artery disease in Asian Indians. Am J Cardiol. 2001;87(3):267-271. 4. Ajay VS, Prabhakaran D, Jeemon P, et al. Prevalence and determinants of diabetes mellitus in the Indian industrial population. Diabet Med. Oct 2008;25(10):1187-1194. 5. Narayan KM, Chan J, Mohan V. Early Identification of Type 2 Diabetes: Policy should be aligned with health systems strengthening. Diabetes Care. Jan 2011;34(1):244-246. 6. Mohan V, Deepa R, Deepa M, Somannavar S, Datta M. A simplified Indian Diabetes Risk Score for screening for undiagnosed diabetic subjects. J Assoc Physicians India. Sep 2005;53:759-763. 7. Ramachandran A, Snehalatha C, Vijay V, Wareham NJ, Colagiuri S. Derivation and validation of diabetes risk score for urban Asian Indians. Diabetes Res Clin Pract. Oct 2005;70(1):63-70.